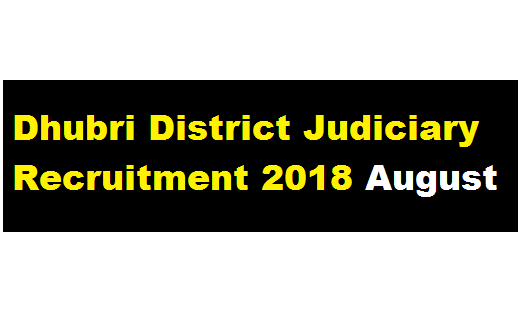 Dhubri District Judiciary Recruitment 2018 August | Peon Posts : Office of the Chief Judicial Megistrate Dhubri has issued a recruitment notification in the month of August 2018. According to the Latest Dhubri District Judiciary Recruitment 2018 August , Application in standard form are invited from the citizens of India, as defined under Articles 5 & 6 of the constitution of India, having registration of Employment Exchange in Assam for filling up the Peon posts under the establishment of the Chief Judicial Magistrate, Dhubri. At AssamCareer.org We have discussed in details about this recruitment. In this section, we will discuss in detail about Recruitment of Peon posts under Dhubri District Judiciary Recruitment 2018 August with all the details and requirement. (i) Existing vacancy :- 1 (one) No. (ii) Anticipated vacancy: – 2(two) Nos. (likely to be vacant on 31-08-2018 & 31-12-2018 respectively due to retirement of Sri Srikanta Roy and Sri Chandra Kishor Sarkar, Peon). Reserve / Unreserved :- Unreserved – 1 No. and O.B.C – 2 Nos. Educational Qualification & Age Limit : The candidates must have minimum education qualification of class VIII standard. Age not less than 18 years and not more than 38 years of age as on 01-01-2018. In appropriate cases, relaxation of age will be admissible as per existing rules. Applications must be accompanied with attested copies of all relevant documents/testimonials in support of the education and other qualifications including experience. Three (3) copies of duly signed recent passport size photographs should invariably be enclosed with the application. The application should be addressed to the Chief Judicial Magistrate, Dhubri. All the applicants shall submit 2(two) nos. of envelop affixing postal stamp 4 Rs.5/- (Rupees Five) in each envelop along with their self address. Last date of receipt of application is 03-09-2018 and the application will be accepted during office hours. All the eligible candidates after scrutiny shall be called upon to appear before written examination for 70 (Seventy) marks and successful candidates of written examination further needs to appear before personal interview for 30 marks.The eligible candidates shall be required to appear for their interview (written / Viva-Voce) accordingly, in the venue to be notified in the notice board / website. 1) Candidates in service should apply through proper channel with NOC from their employer. 2) Incomplete applications will be rejected without any notice. 3) No application will be entertained after the last date fixed. 4) List of eligible candidates along with specific date of interview shall be notified in the official website of Dhubri District Judiciary (www.dhubrijudiciary.gov.in) as well as in the notice board of office of the Chief Judicial Magistrate, Dhubri in due course. 5) Canvassing by any means will immediately lead to rejection of candidature. 6) The application received either by post or by hand after last date of submission shall not be accepted. 7) All other matters regarding the recruitment process which are not specified herein shall be decided by the selection board taking note of the guidelines of the Honble Gauhati High Court. 8) No TA / DA will be admissible.